1.When were you first introduced to ceramics? I started my undergraduate art career in Painting and Drawing. After a horseback riding accident, I was temporarily disabled, my arms and body sore, swollen, and torn raw. As somewhat of a perfectionist, this momentary disabling was difficult but also attractive to me. I started fantasizing about other ways in which I might relinquish ability and control. 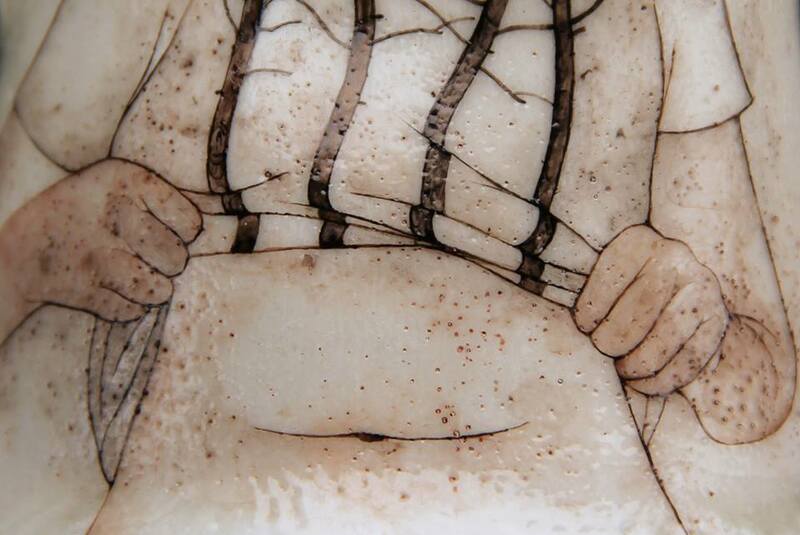 I discovered ceramics, with which I was utterly unfamiliar, and was excited by the idea of making bad, embarrassing work. I wanted to feel free to fail at something. I declared myself a major without having taken a single class. 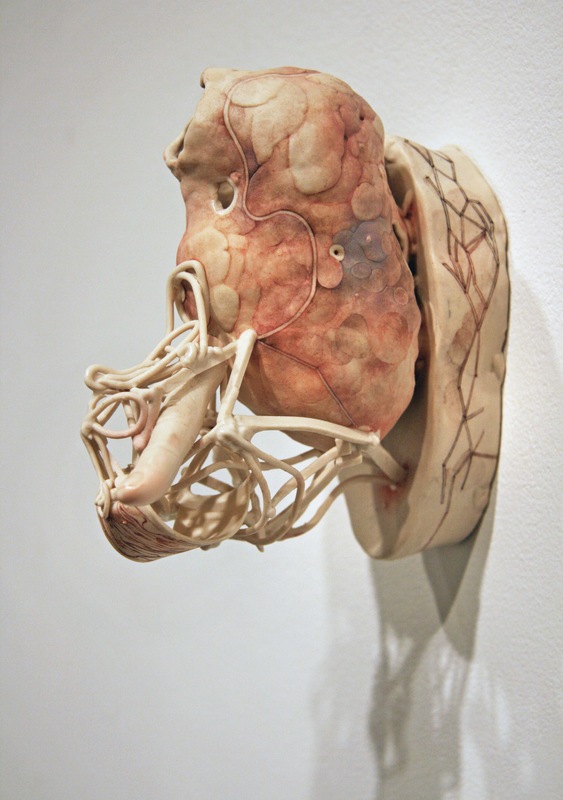 I have, over the years, encountered several ceramic artists whose career was initiated by an injury and have wondered if the physicality of clay doesn’t hold some particular appeal to those who have endured bodily trauma, as though the material, like a kind of golem, might act on our wounded behalves. 2. When and how did you recognize it was a material you wanted to continue to explore and experiment with? I knew immediately. 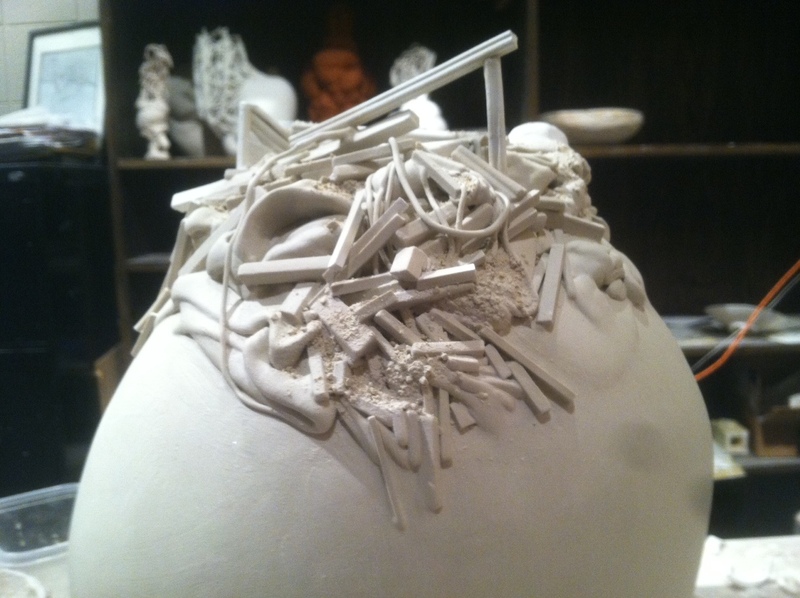 I was enamored with the living quality of wet clay, the negotiations it seemed to request and require, the simultaneous ease and complexity of thought that it stimulated. I discovered in clay a relationship that was less about dominance than exchange and that surprised and challenged me. 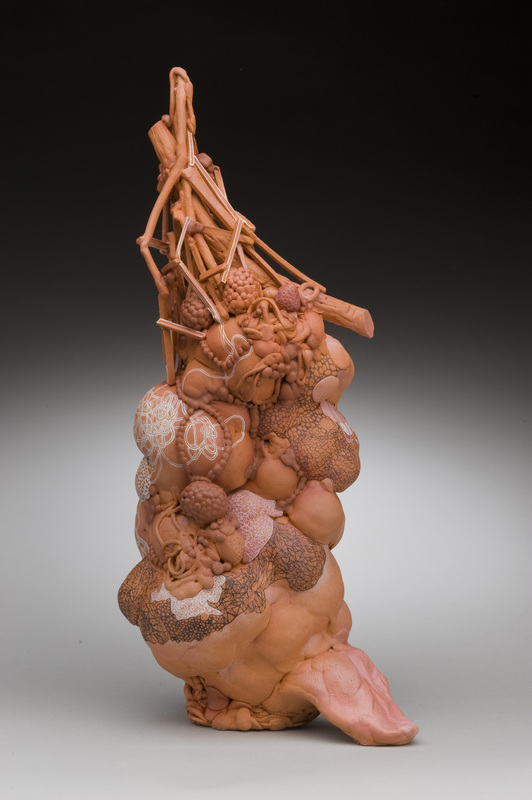 At its best, I believe, ceramics allows a unique collaboration between the artist and the unknown in its various mundane and miraculous-seeming incarnations. 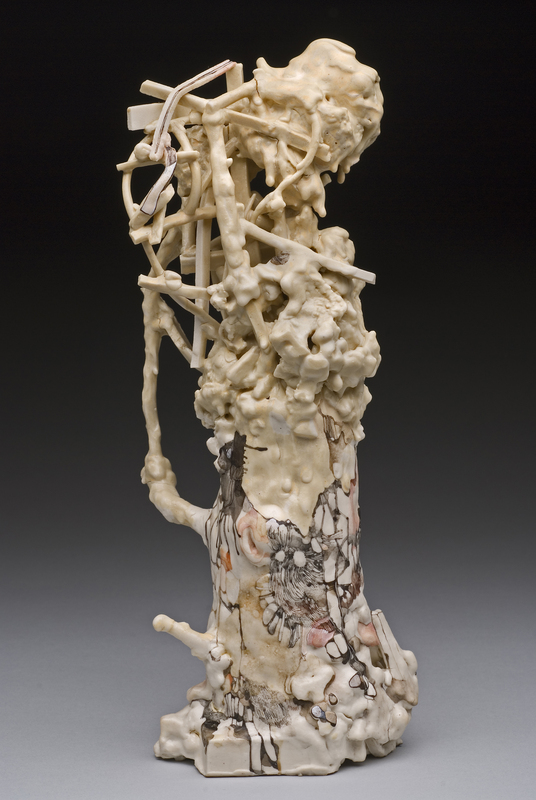 3.Do you have specific ceramic influences or artists whom you admire? There are too many to name. Certain historical ceramics have had a big impact on my thinking, in particular the skewed spirituality of Mimbres bowls, eerily anthropomorphized Meissen animal figurines, the humor and exuberance of Pre-Columbian ceramics, and the slightly off silhouettes of Etruscan ware. But I am equally influenced by folk artists like Howard Finster, Martín Ramírez, and Bill Traylor, and painters like Philip Guston, Dana Schutz, David Humphrey, and Ellen Altfest. The poets Emily Dickinson and Kay Ryan have formed a kind of duet of influence in my studio. Fashion, literature, and film are regularly called on, as well as cultural and scientific oddities like Gaetano Giulio Zumbo’s anatomical wax models of human bodies on display at La Specola in Florence or the elaborate installation of human skeletons along the catacomb walls and ceilings of the Capuchin Monastery in Rome. 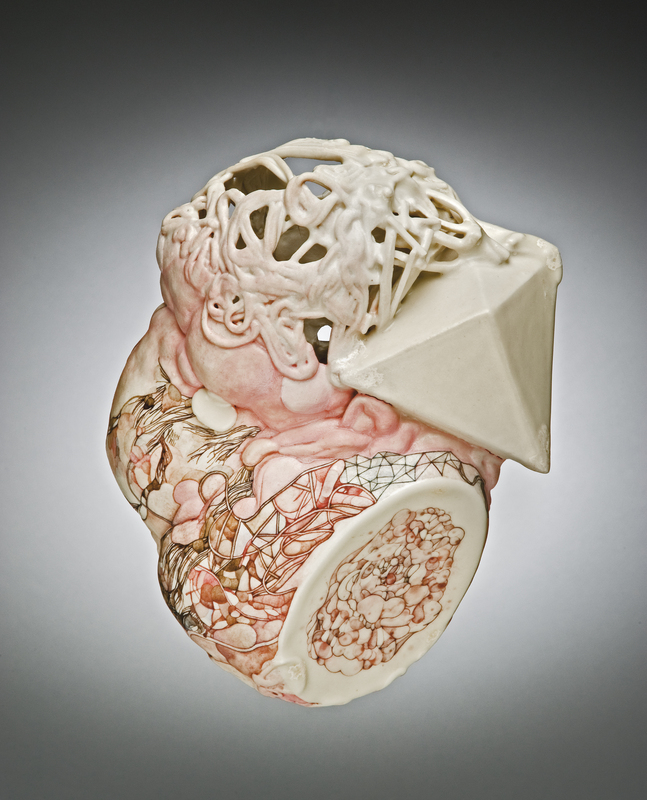 In contemporary ceramics, three artists have loomed most large in instilling in me, through their work and/or their words, a belief in myself as an intuitive maker: Andy Nasisse, Jean-Pierre Larocque, and Sunkoo Yuh, each of whom, I believe, manifests mystery with a fierce but sensitive intellect and an extraordinary physical fluency. 4. When did you begin drawing? I have been drawing and painting for as long as I can remember. My mother used to set reams of computer paper in front of my sister and I that we would turn into epic narrative scrolls. I was enrolled in an oil painting class in the 2nd grade and took a very particular satisfaction in having depicted a sunset that felt as opulent and terrifying as I found them in life. My earliest childhood drawings are still my favorite things I’ve made. 5. How and when did you first recognize your Southern upbringing as a powerful influence on your work? I think sometimes it takes leaving a place to understand how much it is a part of you. It wasn’t until I left Athens, Georgia for Alfred, New York in 2005 that I started thinking deeply about the history and characteristics of the region from which I came. The South is a place of excess and contradiction, of violence and beauty, humor and tragedy shaped by stories and embroidered with voices. The fertile and teeming jungle of the South, in contrast to the white and stoic snowy hills of western New York, swarmed in my imagination. As stone-hard apples formed on the trees outside my window during my first fall in New York, I recalled the sugary squish of Mississippi figs and the constellation of mosquitoes they attracted. Gradually, I came to miss the soft but rangy sounds of the Southern accent and the ornate words of affection that decorated Southern speech. That led me to return to the myths and fables that I grew up on, and suddenly, I saw connections between what I made and where I came from that I had never seen before. The sense of excess, the narrative underpinnings, the contained contradiction of violence and beauty were all there. I don’t know that my work is ever really about the South, but I do believe that it is distinctly of it. 6. When you are working on a piece, how does the form develop? The forms have changed over time, but generally could be fit into at least one of three categories: animal forms, body forms, and vessel forms. I typically have one or two of these categories in mind when I begin. I may have sketched out 5-10 pieces in advance, circling a couple that interest me the most. Once I begin building, however, it is as if I am balancing on a semi-slack line of thought, one step after the next, with little perspective on where I am going but faith through necessity that I will get to the other side. Often, I am working with a mass upon which or out of which emerges a kind of fragile structure—architectural, skeletal, biological. While this process is delicate and sometimes disastrous, it is also, in many ways, the most pleasurable; it is slow but satisfying. On a good day, the results surprise me. 7. 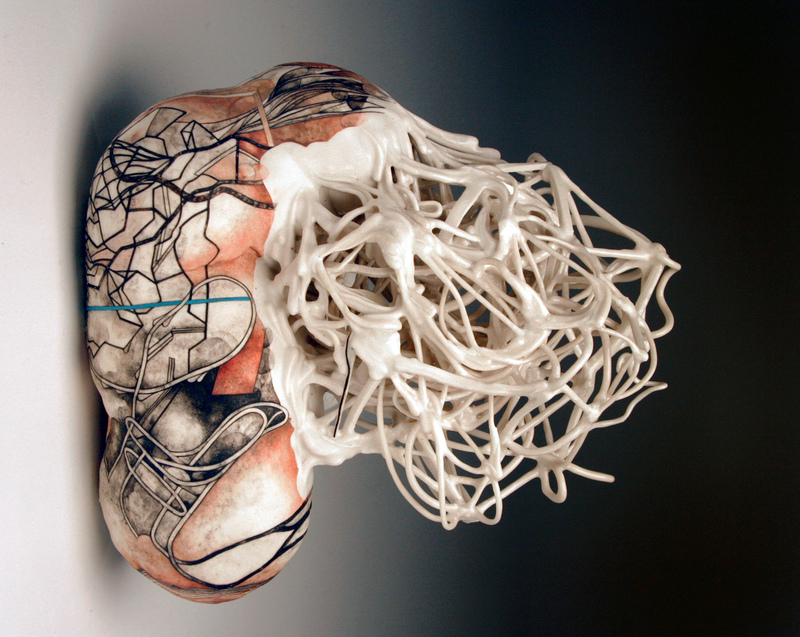 Do the forms of your sculptural work respond to the imagery or do you make forms as a result of a drawn image you would like to express and explore? Because the sculptural component of my work is largely improvisational, I do not typically start building a piece with a drawing in mind. The “drawings” (I call them drawings too because they are so intrinsically connected to line, although they are technically paintings) usually respond to the form or to the combination of form and glaze. I am interested in the movement between two and three dimensions, between illusionary or imaginary space and real space and the somewhat mystifying ways in which they overlap. 8. Do you attempt to facilitate a specific experience for the viewer? The short answer is: no. Although I am interested in and often get great delight out of others’ descriptions of experiences they have had with my work and the ways in which they do and don’t resonate with my own, I would not say that I have an aim to facilitate any specific experience in others through my work. I do not, personally, feel that this is my role as an artist. Artmaking, for me, is an engagement with ambiguity. It is an immensely private act with the potentiality of a public end. I try not to place on the work any expectations for how it should behave in the world. 9. You write: “How do we know anything, short of consuming it or being consumed?” Do you consider the viewing of your work a form of consumption? I believe that everything that we do of any real significance involves some kind of consumption. I am thinking of consumption as an act of entrance—the interaction between body and object, or body and body, or body and matter, or body and idea. Consumption can have both positive and negative connotations. It can nourish you and it can possess you. I can hope but never presume that my work might have this effect on someone. 10. How do you balance teaching and a studio practice? Delicately. In truth, each informs the other in complex and profound ways. I can only teach based on my particular experience of being in the world. Much of this perspective has been informed by artists and teachers who have demonstrated to me the power of a personal point-of-view. The difficulty and complexity of my work in the studio keeps me honest and humble in the classroom. The words of encouragement or critique that I offer my students, I can usually turn right back on myself. After a while, the process forms a kind of loop, and the point where teaching begins and my own learning ends becomes indistinguishable. 11. How has teaching and living away from the South influenced your studio practice? I think it will take time to understand all the ways in which it has impacted me. There is something very particular about the sense of space in the West as opposed to the South that is changing the way I think about scale and form. The South inspired in me a kind of cozy claustrophobia through its abundant vegetation and dense hills. In the West, I can watch a storm stalk its way across the valley or I can climb a mountain to stand above the winter fog. Objectness is continually reemphasized here even while the scale is so much more grand. In my latest work, I find myself engaged with these shifts as well as the complex notions of spirituality that dominate both Georgia and Utah. Still, like a fluent speaker of a second language, the space of the West, I suspect, will always feel secondary to me, always an environment in translation. In many ways, my work is concerned with this translation; it is here, within the threshold of the known and the unknown, that discrete objects can transform and be transformed. 12. Where can your work be seen? My work will be included in a group show entitled Immersive Stages at NCECA this March, and I have an upcoming solo show at the Signature Gallery in Atlanta, Georgia in the Fall.